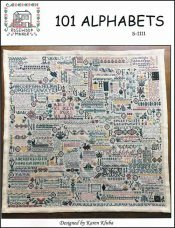 101 Alphabets [D8874] - $35.00 : Yarn Tree, Your wholesale source for cross stitch supplies. Cross stitch chart from Rosewood Manor. Alphabets, alphabets, alphabets! If you are looking for an alphabet...look no further! Rosewood Manor has you covered with "101 Alphabets!" This design features "101 Alphabets," with a letter from each alphabet stitched among the different fonts of each alphabet (A-Z). Among the letters of the alphabet, you will also find birds, flowers, trees, bees, fruit, etc. After stitching this design, you will know your ABC's very, very, well! Enjoy! Stitch count is 499 x 499.